Mark Sisson of The Primal Blueprint recently ran a contest on his site asking people to send in a picture of themselves surrounded by the food they eat in a week. Naturally, most of the people that sent pictures eat a pretty primal/paleo diet. 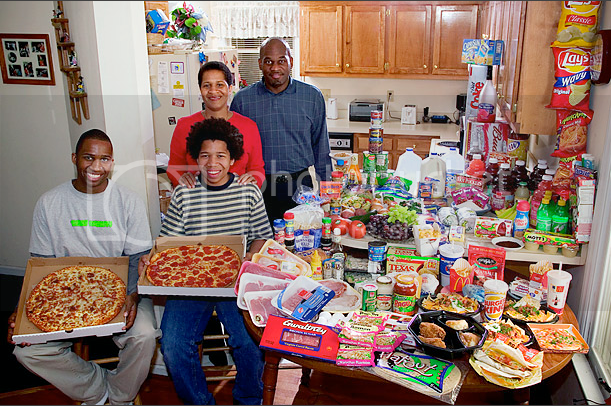 It got me thinking about what I eat in a week and how many "cheat" items may find themselves in the picture. The big question is if your diet is derailing your hard work at the gym. Are you getting the results you want and if not why? Is it because you are eating junk that is wiping out all of the time spent exercising? Think about what your picture of a weeks worth of food would look like. Does it look like the picture below, from Mark's site or does it look more like the picture under that of a typical American family featured in the NY Times? 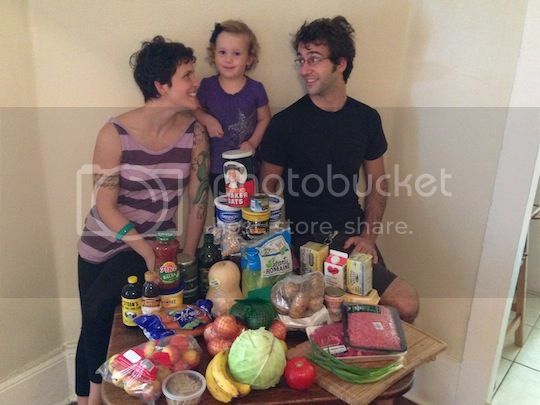 Does the amount of food in your picture look like it is meant for one person or an entire family? These can be tough questions and you might not like the answers. But if you aren't getting the results you want (weight loss, body changes, strength gains, etc...) then it might be time to take a hard look at your diet.